Shave biopsy is a common office procedure used to partially or completely remove skin growths for both diagnostic biopsy and treatment purposes and is done by shaving lesions off the skin without penetrating beneath the skin. 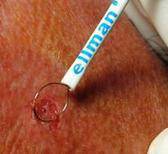 It is simpler and less expensive than a full-thickness excisional biopsy. Shave biopsies do not require stitches and produce a less noticeable scar. Also, infections are uncommon. Under the local anesthesia, the skin lesion is shaved with razor blade first, the radio frequency device is used to remove any remaining tumor cells from the base of the wound, while smoothing the wound edges and also improves the final scar appearance. The specimen is sent to the pathological lab for the examination. The scar will appear red at first but will lighten over the next year. Avoid getting the wound sunburned for several months after the surgery so that the scar doesn't get darker. ©2007-2013 Procedure Clinic. All rights reserved. One Stop China Corp.